JAKARTA, Indonesia, August 24, 2011 (ENS) – Indonesia is revving up its entry in the electric car race with the SKEV-1, formally known as Signal Kustom Electric Vehicle 1. Based on a 1993 Honda Genio, the SKEV 1 electric motor was designed by the Indonesian Institute of Sciences and the body was modified by Signal Kustom Built. Now known across Indonesia for its auto modifications and custom painting, Signal Kustom Built was founded in Bandung in 2005. The Indonesian Institute of Sciences, the Lembaga Ilmu Pengetahuan Indonesia, LIPI, displayed the electric SKEV-1 on August 10 on the occasion of Indonesia’s National Technology Day. “SKEV-1 is expected to spur innovation and creativity of other peoples’ children to be technological pioneers,” LIPI said then in a statement. Andre Mulyadi of the Custom Signal Bandung told reporters that the SKEV-1 was originally created to participate in the auto modifications contest Autoblackthrough 2010. The LIPI team built their dream of a sports car in “the form of a Formula 1 car and car LeMans 24 Hour endurance race” powered by a 60 hp electric motor. According to Abdul Hapid, director of LIPI’s mobility department, the SKEV-1 can be driven over 140 km/hour (87/mph) but its peak speed has not yet been tested. 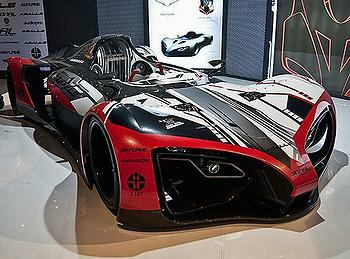 Other reports claim the SKEV-1 is capable of reaching a top speed of 125 mph. Hapid said the SKEV-1 comes equipped with a new generation of lithium-ion battery with higher energy density and a charging rate of an hour compared to the standard battery charging time, which takes from six to 10 hours. As an electric vehicle, the SKEV 1 has a regenerative system that is able to restore power to the battery during braking and deceleration. The SKEV1 is sponsored by AutoVision for its HID headlights and rear LED lights, which are easier on the battery. The car is designed with a regenerative braking system, allowing the battery to recharge with every step on the brake. A dashboard indicator shows the distance the driver can go on what’s left in the batteries.